"Before I came to Mathnasium, I could sum up everything I felt about math in one word: 'EVIL!' I hated math. I used to think that if the devil had a last name, it would be 'Math'! Numbers and equations always confused me, patterns and graphs made me sweat, and let's not even get started on measurements. Mathnasium has been my safe haven. They truly have shown me the light when it came to addressing my fear and provided me with the tools that I need to rebuild my prior knowledge so that I won't forget it. Trust me, I won't! Math is no longer a subject I shy away from, but it is a subject I can boldly accept and understand. I went from failing tests to scoring 100 points higher on my SATs in less than two months. Now that's a real 'test'imony! I have raised my confidence and my best scores, all thanks to Mathnasium!" "Her recent report card, received over the weekend, shows a B- in math now. We're all smiles around the house. We love everything you and your staff have done for Mimi." "My fourth grade daughter was struggling in math. You could tell, as math was just cascading and building up on her th the point where she was losing more of the basics and was falling behind. My wife and I were frustrated, as we weren't able to convey/teach groupings in multiples and this was causing her grades to fall. We brought her in for only a month at the end of the school year, and just in that short amount of time we saw a great improvement in her love for math. It was like a lightbulb came on in her head. Kobad is an excellent instructor and chooses his tutors very carefully and tries to instill the same kindness and understanding that he exudes. This is the teacher all would like to duplicate in the school system, but unfortunately it's a difficult combination to come by. I am going to continue her long term once summer ends, as I know this will help her as she goes into 5th grade math. It's worth every penny!" "I first noticed her improvement when her dad and I were discussing a possible upgrade to her cell phone. When we learned the price, I blurted out, 'WOW, $117. Well, we may have to wait on that!' and her immediate response was, 'Mom, if you two split it, that's under $60 a piece, $58.50 to be exact.' I was so impressed by her response. ... This may seem like just simple math to you; however, my 11-year-old would not have been able to calculate that just a few months prior." "More good news is that I just received her report card and she went from a D, subject to a fail, in math, to a C-E-E in just five weeks. The grade also included a teacher's comment of 'I'm proud of your child's achievement.' Thank you SO much for your efforts and expertise. 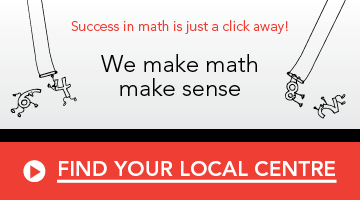 You (and the Mathnasium program) truly make a difference!" "She asks to come to Mathnasium. ... keep up the good work." "... (Sarah) is so excited because she now has an 83 in algebra II and is steadily climbing. She should be able to finish with a strong B if she keeps this up. I know she'll want to tell you all about it tonight if you're still there. ... It's neat to see her excited about math for the first time ever!" "He is no longer scared of math. ... he asks to go to Mathnasium." "Kailee's confidence has improved tremendously in all her subjects. Mathnasium has not only helped in math, it's helped in all her subjects. All of Kailee's grades have improved. She made honour roll for the first time since pre-K this year. Thank you, Mathnasium!" "Last week the 4th grade had its math benchmark test. Gracie made 91% and had the 4th-best grade in her [class of about 40 students]. Gracie was so excited, as were we. Thanks." "Just a quick note to let you know [how helpful] you have been with Ali and her math class. As a result of her time spent at Mathnasium. … she [improved] her SAT score [and] her pre-calc class was a much more positive experience because of [your] help. ... I will share our success with anyone I know who might have a need for your service." "... Math isn't a task anymore, but a challenge." "I just wanted to send you a quick note regarding Raven's math grade this last grading period. Raven has always made A's or B's on her report card in math, but she has never made 100% …I am pleased to inform you that this last grading period she made 100%! Raven loves going to Mathnasium. I think she is really starting to see the benefit in her going at least once a week, if not more. Every week she even asks me what days she will be going that week in order for her to clear her schedule to make time to go. Thanks for all that you do and keep up the good work." "Amanda is in advanced classes and is for the most part an A student, but she struggles with math, and her grades had gone down to B's and C's... This week, all of the students in her math class were struggling with their lesson—none of them got it. Amanda raised her hand and proceeded to show her classmates how to solve the problem the way Marc taught her." "She feels better about herself since coming here and understands how to solve problems she is taught." "After only two sessions at Mathnasium, she was asking me to take her back for a third session right away. She said that she loves it at Mathnasium!"